Maldivian opposition supporters scuffle with security forces officers during a protest demanding the release of political prisoners in Male, Maldives, Feb. 2, 2018. The Supreme Court in the Maldives is trying to impeach President Abdulla Yameen for not obeying its order to release jailed opposition leaders, the attorney general said Sunday, warning of further instability in the Indian Ocean nation. Home to about 400,000 people, the Maldives has been drawn into a regionwide tussle for influence between India, with which it has long-standing political and security ties, and China, which opened an embassy in 2011 and has offered technical and financial assistance to build infrastructure. FILE - Abdulla Yameen takes his oath as the president of Maldives during a swearing-in ceremony at the parliament in Male, Nov. 17, 2013. 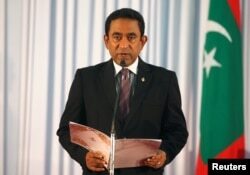 ​Will court attempt to remove president? Riot police stood guard outside government offices in Male and the Republic Square, a site of protests by opposition activists. The combined opposition said it feared a military takeover of the islands to preserve Yameen’s grip on power. “The intimidation of the Supreme Court justices, with the highly irregular statement made by the attorney general defying the Supreme Court, supported by the two chiefs of the security forces, is tantamount to the effective sidelining of the judiciary and in direct contravention of the constitution,” it said in a statement. FILE - Maldives former president Mohamed Nasheed speaks during an interview with Reuters in Colombo, Sri Lanka March 29, 2017. The crisis poses the biggest threat to Yameen’s control of the Maldives since he took power in 2013, defeating Nasheed in an election the latter’s supporters say was rigged. Critics of the government continued to face pressure. On Sunday, police raided the home of Hassan Saeed, the head of the judicial administration department, which the opposition said was considering a corruption investigation into Yameen. Police said in a statement they were looking to arrest Saeed over an investigation into apartment purchases. They were also inquiring whether family members of Supreme Court Chief Justice Abdulla Saeed and Supreme Court Justice Ali Hameed, who handed down last week’s ruling, were involved in the apartment purchases, police said. The political drama in the Maldives, which is made up of 26 coral atolls and 1,192 individual islands, centers on tiny, densely populated Male, the base of all its major institutions. Besides political wrangling, the largely Muslim island chain is grappling with problems such as significant numbers of radicalized youths who enlisted to fight for the Islamic State militant group in the Middle East. On Saturday, Yameen fired his second police chief in three days.